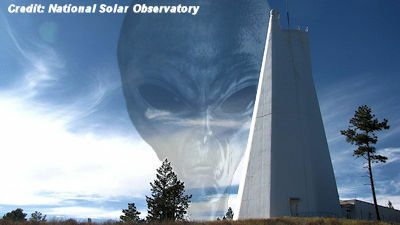 Mysterious goings-on at a New Mexico solar observatory have been hot news. Had astronomers found a lethal solar flare, or even signs of alien life? Out-of-this-world explanations got lots of traction when New Mexico facility suddenly shut down. solar observatory have been hot news. On Sept. 6, the Sunspot facility on Sacramento Peak in the southern part of the state was strung with yellow tape, and employees were sent home. This set off alarm bells across the Internet: Had astronomers found a lethal solar flare, or even signs of alien life? And was there a government cover-up? After days of rampant speculation, authorities finally fessed up and explained the situation as a “security issue.” They offered scant details but indicated that there had been a threat to people on the peak and that secrecy was necessary. Mysterious Evacuation Of Solar Observatory ... Espionage? Solar Observatory Shut Down: Did Researchers Spot Extraterrestrials?